Clock Delay By STUDIObloomm | OhGizmo! If you’ve been looking for a clock that’s hard to read, takes up a lot of space and is inexplicably expensive, you probably won’t find anything better suited than the Clock Delay from STUDIObloomm. 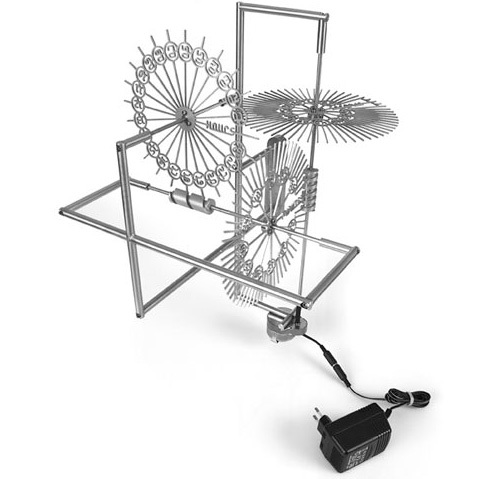 It uses three cogwheels to represent the hours, minutes and seconds with the current time being shown at the point where the cogs nearly meet. The clock was apparently designed to rekindle an interest in technology, presumably since all of its mechanisms are exposed, but I’m not sure if it’s cool enough to make me interested in paying about $1,885 for one. ← Is This The Production Chevy Volt? This would be really cool if it was a build-it-yourself kit and was $25-50.